The same procedure as above is in the following applied to the HadAM3 model, which is the latest model version of the Hadley Centre. This model is particularly interesting, as it has been running both without aerosols and with a (simple) aerosol climatology. This allows the specific assessment of the effects of a simple aerosol climatology on the shortwave radiation budgets, as discussed in details in Cusack et al. (1998). At the TOA both model versions are in good agreement with the satellite data (Fig 3a), as the other GCMs before. The shortwave absorption within the atmosphere is enhanced in the model which uses an aerosol climatology. This helps to reduce the biases compared to the observational estimates in the atmosphere (Fig. 3b) and at the surface (Fig. 3c), at least at lower latitudes. This suggests that the high value of global mean atmospheric absorption in HadAM3 (76 Wm-2, cf. Table 1) is closer to reality than the lower values of the other GCMs. Still, a significant lack of atmospheric absorption remains at low latitudes also in the HadAM3 model with aerosol, similar to the other models in Fig. 2. The simple aerosol climatology is therefore not capable of entirely removing the absorption biases. A more detailed analysis (Wild and Slingo. in prep.) 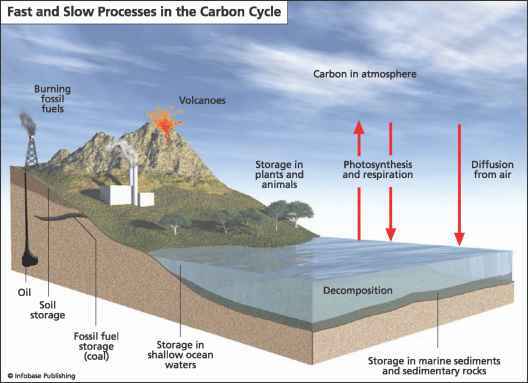 shows, that this lack of atmospheric absorption is largely restricted to areas and seasons with extreme loadings of aerosols, such as from biomass burning or desert storms (cf. Wild 1999). Such regional and seasonal aerosol peaks are not considered in the simple aerosol climatology used in HadAM3, which includes no seasonal and spatial resolution. In general, the lack of absorption in the GCM atmospheres discovered above can either be due to a lack of absorption in the cloud-free atmosphere, or in the clouds. This aspect is further elaborated in the following. To estimate the contribution of the cloud-free atmosphere to the biases discussed above, we are currently constructing an observational dataset of clear-sky climatologies at selected sites worldwide (cf. Section 2). These climatologies are obtained from composites of cloud-free episodes at sites with measurements of high quality and high temporal resolution. So far, clear-sky climatologies have been established for 7 sites in Germany with long-term observational records of hourly data. The sites included are Norderney (53.72° N, 7.15° E), Hamburg (53.63° N, 10.00°E), Brauschweig (52.30° N, 10.45°E), Braunlage (51.72° N, 10.53°E), Trier (49.75° N, 6.67° E), Wuerzburg (49.89° N, 11.73°E) and Weihenstephan (48.40° N, 11.73°E) (Liepert et al. 1994). Combining the surface clear-sky climatologies at these sites with TOA clear-sky climatologies from ERBE allows an estimate of the shortwave absorption within the cloud-free atmospheric column above the sites. The comparisons in the following are based on annual averages of model-calculated and observed fluxes. Since the biases at each individual site were found to be very similar, results will be shown in terms of averages over the seven German sites. Annual mean shortwave absorption under cloud-free condition at the surface, averaged over the seven sites, are shown in Fig. 4a, for the five GCMs and the observations. The GCM values cover a range of There is a general tendency in the models to significantly overestimate the clear-sky surface absorption, with biases up to 25 Wnr2, and an average overestimation of 13 Wm~2. The net fluxes at the TO A, i.e. the rate of absorption of the entire Earth system, cover a range of under clear-sky conditions, thus they are more consistent than the surface values (Fig. 4b). The observed estimate is only 1 Wm"2 lower than the average over the model values, and the maximum bias is reduced to compared to at the surface. Hence, the problem in the models is not so much one of capturing the total amount of solar energy in the cloud-free surface-atmosphere column, but rather one of partitioning this energy between atmosphere and surface. This is visible in Fig. 4c, where a direct comparison of atmospheric absorption (the difference between the absorption at the TOA and at the surface) is shown. 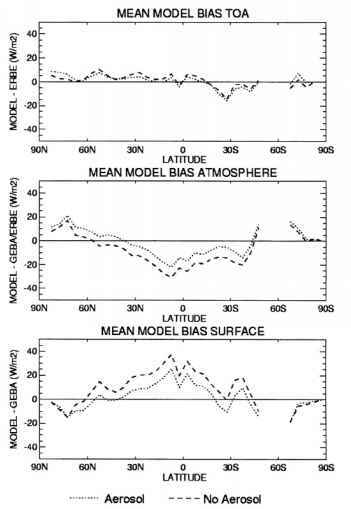 The models show a tendency to underestimate the absorption in the cloud-free atmospheric column, with biases up to 18 Wm"2, and an average underestimation of 12 Wm-2. Thus, the excessive surface absorption can be predominantly attributed to a lack of absorption of solar radiation in the cloud-free atmosphere and, only to a lesser extent, due to insufficient backs-cattering of solar radiation to space. This behavior under clear-sky conditions is thus very much the same as found previously under all-sky conditions on more global scales (Section 4). This further emphasizes the importance of the cloud-free atmosphere in the discussion of the "anomalous atmospheric absorption" phenomenon in the models. The principal absorbers of solar radiation in the cloud-free atmosphere are water vapor and aerosols. Since water vapor is abundant in the GCMs at the German sites, as shown in Wild and Liepert (1998), the lack of atmospheric absorption in the GCMs must be due to the lack of aerosol absorption or deficiencies in the radiation codes themselves. Such deficiencies have been detected in stand-alone validations of the radiation scheme for the ECHAM3 GCM, which showed an excess insolation even with correctly prescribed atmospheric input profiles of humidity and temperature from radiosondes (Wild et al. 1995, 1998a). An overestimation of surface insolation under cloud-free conditions was also found in other radiation codes (e.g., Kato et al. 1997, Kinne et al. 1998). Similar deficiencies may therefore be present in many GCMs. The latest model version of the Hadley Centre, the HadAMS, shows an increased atmospheric clear-sky absorption when compared to the precursor version HadAM2b and is now in close agreement with the observational estimate (Fig. 4c). An increase in atmospheric absorption of 5 Wm"2 is already noticeable in HadAM3 NA which, as HadAM2b, includes no aerosols. This is related to the improved radiation code of Edwards and Slingo (1996), which calculates higher water vapor absorption compared to the code used in HadAM2b (A. Slingo, S. Cusack personal communication, 1999). While in many GCMs the lack of water vapor absorption is a major cause for the lack of shortwave absorption in the atmosphere, this has no longer the same relevance for HadAM3. A higher water vapor absorption is also found in the radiation code used in the ECMWF model (Morcrette 1991), which was shown to be in excellent agreement with direct observations in standalone validation studies (Wild et al 1998b). The above comparisons also suggest that, in addition to a proper treatment of water vapor absorption, the inclusion of aerosols is essential to bridge the gaps between model-calculated and observed estimates of atmospheric clear-sky absorption. The models which do not include aerosols (HadAM2b and HadAM3 NA) show the largest underestimates, while the introduction of an aerosol climatology into HadAM3 leads to an excellent agreement with the observational estimate. The aerosol effect in HadAM3 (9 additional atmospheric absorption) is of comparable magnitude to other modeling studies (e.g., Garratt et al. 1998 and references therein). The inclusion of aerosols in HadAM3 leads also to closer agreement with observations at the TOA, due to the increased reflectance (Fig. 4b), in line with the findings in Cusack et al. (1998). However, it should be noted, that although this simple aerosol climatology may capture the annual mean aerosol effect at the German sites with moderate aerosol loading adequately, this no longer applies in areas with very high aerosol loading, particularly in the Tropics (Wild 1999, cf. Section 4.2). In summary, the above indicates that GCMs should be equipped with both a state-of-the art radiation code and a sophisticated aerosol climatology in order to avoid the biases in clear-sky atmospheric absorption typically found in current GCMs. Under all-sky conditions at the German sites, a similar comparison of the annual mean shortwave absorption at the surface, at the TOA and within the atmosphere is shown Fig. 5. The presence of clouds tends to increase the inter-model differences, which is particularly evident at the TOA (Fig 5b). Again significant deviations from the observed estimates become apparent. The presence of clouds tends to increase somewhat the atmospheric absorption in the models (cf. Fig. 4c and 5c), whereas the observational estimates of atmospheric absorption derived under clear and cloudy conditions are very similar. The increase in atmospheric absorption in the cloudy model atmospheres therefore partly compensate (for CNRM, HadAM2b, HadAM3 NA) or even overcompensate (ECHAM3) for the underestimated absorption in the cloud-free atmosphere. R equal one states that the presence of clouds does not alter the overall absorption in the atmospheric column. The magnitude of R is currently highly controversial, and previously published estimates range from R close to 1.0 (e.g., Li et al. 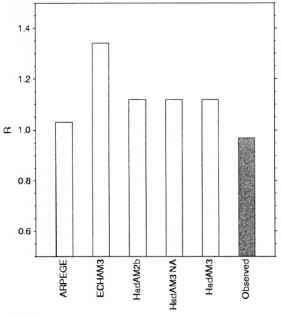 1995) to as high as 1.5 (e.g., Cess et al. 1995, Ramanathan et al. 1995), the latter suggesting a much higher absorption of solar radiation in the cloudy- than in the cloud-free column. Values of R calculated by the GCMs and derived from the observational estimates for the German sites are given in Fig. 6. The GCM values are in the range of 1.03 (ARPEGE) to 1.34 (ECHAM3), i.e. the inclusion of clouds leads to a certain increase in shortwave absorption in the GCM atmospheres which is, however, substantially below the 1.5 suggested in Cess et al. (1995). The observational estimates at the German sites, on the other hand, favor a value of R close to unity (Fig. 6), suggesting that the presence of clouds does not significantly alter the overall absorption in the atmospheric column, at least not for the region under consideration. Note that equal absorption in the cloudy and the cloud-free atmosphere does not exclude the possibility that the clouds themselves show an enhanced absorption. It rather states that a possible additional absorption by clouds is offset by the cloud shading which prevent the photons from entering deeper into the atmosphere, thereby lowering the chance of being absorbed (cf. e.g., Li et al. 1995). At the German sites, the latter effect even seems to dominate slightly, resulting in a somewhat lower absorption in the cloudy atmosphere than in the cloud-free atmosphere and R = 0.97. The present results are thus in line with the findings of Li et al. (1995) who also determined values for R lower than one particularly at high latitudes. They used a satellite-derived estimate as a reference for the clear-sky surface absorption, while the present study uses direct observations of the same quantity. For the German area specifically, Li et al. (1995) obtained R = 1.1, which is somewhat higher than the value of 0.97 found here. This difference may be explained by the neglect of aerosol in the algorithm used in Li et al. (1995) to derive surface clear-sky absorption from satellites, thereby slightly underestimating the shortwave absorption particularly in the cloud-free atmosphere (Z. Li., personal communication 1999). On the other hand, there are no indications in the information provided by the direct measurements which would support R values as high as 1.5. A value of R equal 1.5 implies for the German sites a difference of 30 Wm-2 between the cloudy and the cloud-free atmospheric absorption. It seems highly unlikely that the uncertainties inherent in the observational estimates could mask a signal of such magnitude. The observational estimates therefore provide no indications that cloud absorption should be higher than presently found in the GCMs. This suggests that the underestimated shortwave absorption in the GCM atmosphere in Figs. 2 and 3 are predominantly caused by a lack of absorption in the cloud-free part of the atmosphere rather than in the cloudy part. This is related to an underestimation of water vapor absorption in GCMs which use radiation schemes based on older spectroscopic data, and additionally to an inadequate representation of aerosol absorption particularly in areas with high aerosol loading.